You can help others to Be Life Ready®! Other than a willingness to help others there are no specific requirements for delivering the Be Life Ready® information to others in your community or organization. With the help of a downloadable Facilitator’s Guide and PowerPoint you can present the program to any group of individuals who you feel could benefit from learning about the Keys to Be Life Ready®. In addition, a Be Life Ready Poster is available to print and a Be Life Ready Pledge can be used to have individuals make the commitment to accept responsibility and work hard to address the Keys to Be Life Ready. 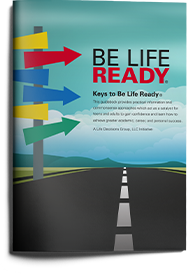 If you like, you can purchase Be Life Ready® Guidebooks to provide participants with copies to use and keep as a lifetime resource. Individual coaching sessions via phone or Skype with a certified life coach can be scheduled for 30 minutes by contacting me through email. The rate for a 30-minute session will be $25, payable online, prior to the scheduled appointment time.